The cover called my name. Blue is one of my favorite colors. The cover is downright book gorgeous. I just had to buy it. 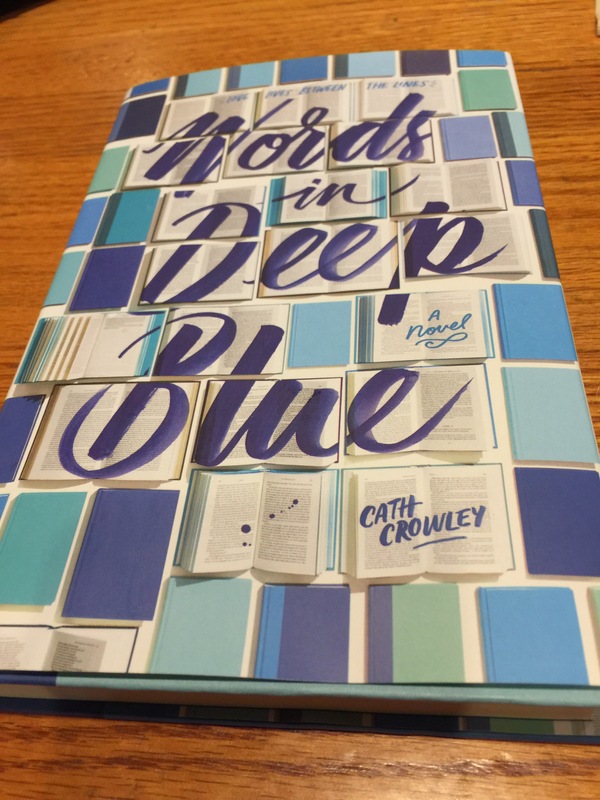 Words In Deep Blue is about used to be best friends Rachel and Henry. Rachel comes back to her home town to distract herself though she doesn’t want to deal with Henry after he didn’t respond to her goodbye letter she left him after she moved away with her family three years prior. Henry is a nerd who lives at his family’s used bookstore that has living quarters above the store. Henry has always loved Amy. Rachel used to love Henry, but Amy always kept coming back in the picture distracting Henry. She learned to get over him after she moved, but having moved back to stay with her aunt, Rachel realizes Henry still has his charm minus the problem of shallow Amy. Rachel gets a job at Henry’s family bookstore for the summer. Will Henry and Rachel get along working together? Can they mend their friendship? Henry’s dad asks Rachel to catalogue the letter library. This section of the store is where people can leave their favorite books. These books other patrons can highlight favorite passages or leave letters for others inside their favorite books. This is a tedious process. Reading the letters left behind Rachel realizes different romances have blossomed and some people don’t realize who their admirers are. This novel is sweet. It makes me miss working at a used bookstore. Bookworms are a unique bunch to work with and have as customers. We are quirky and march to the beat of our own drum. Used bookstores aren’t necessarily cash cows as a means to get rich, but the quality of connection between patrons and workers is priceless. Being around the mildew smell of old books is a perfume all on its own. There’s a peacefulness like walking into a church when a bookworm walks into a bookstore. If you love books, bookstores, reading and friendship with a potential for romance then I highly recommend this savory read.